Stop worrying about your teeth: You need not stay back at your place because you do not have a nice smile, or you have a missing tooth that makes you feel awkward in the public. You do not have to limit yourself to the fun activities you can have with your group because you feel your supported replacement tooth may fall anytime when you talk or laugh. Dental implants restored teeth let you live your life at ease without any worries. Retaining your natural face shape: Have you ever seen a person without teeth? What does this face structure look like? A face without tooth or teeth may sag and can sink. This makes you feel as the person is always sad. Dental implants help you in retaining the natural shape of your face. Provides long term solutions: The conventional dental bridges can only help you for a maximum span of five to seven years, but there may be chances that you will have to get them replaced once in between. Dental implants may demand to get a check up periodically, but they last a lifetime if placed properly and taken good care. Protects the bones that are healthy: You may deteriorate the Jawbone if you have empty spaces in your mouth due to losing one or more teeth. Under certain circumstances, the jawbone loses its strength and the firmness due to empty spaces in the jaw. Dental implants provide you dental restoration options the preserves the natural bone and improve the growth of the bone. Keep your teeth where they belong: During conventional implants there are certain cases when you have to take the denture out from your mouth and place it in a solution under certain circumstances. Dental implants give you the freedom to let you keep your teeth to where they belong, in the mouth. No speech issues: You may experience problems while talking when you have dentures that you have to fix and take off everyday. The pronunciation gets affected, and you may face struggling to communicate. The dental implants make you comfortable during the conversation as the implanted teeth functions as your natural teeth. No cavities: There is his most important advantage of implanted teeth. Cavities do not occur in implanted or restored teeth. Though, you may have to visit your dentist for a regular check-up and clean-up so that your gums stay healthy and do not face any problems. Eat whatever you feel like: You can eat the food that you like without any hesitation. You can get the taste of any food you like without getting uncomfortable that you may feel with the removable dentures. Helps in protecting your healthy teeth: While placing a denture, your dentist may have to grind away your teeth on both the sides of the tooth that is missing which may cause damage to the healthy tooth. 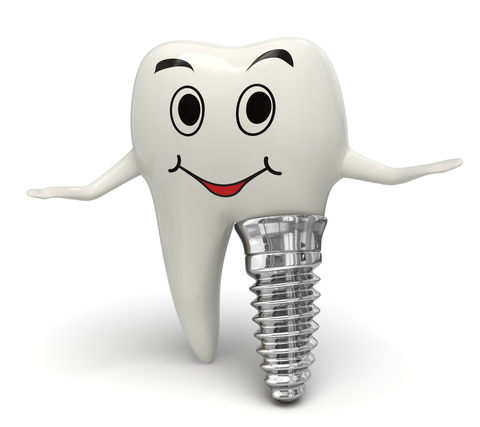 The tooth is then attached to the modified implants and thereby loses its strength. Dental implants directly reach the jaw where the tooth has been missing and does not grind the healthy tooth. Tooth implants delay are one of the best solutions available if you want to fill the empty spaces that are created due to the missing tooth. Consult your dentist and ask if this may work for you.